When you live in a house full of cookie monsters (and are one yourself...) running out of sugar and flour is no excuse to not have cookies ready for dessert. So what's a girl to do? Google flourless sugar-free cookies, of course. 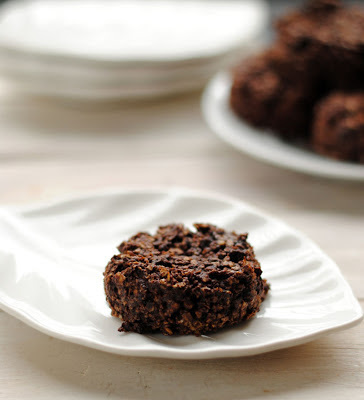 And I was lead to these chocolate oatmeal cluster cookies, which are flourless and sweetened naturally with honey. The bonus? These can easily be gluten-free cookies if you use gluten-free oats, too. Everyone wins! Preheat oven to 350F, and either grease a baking sheet or line it with parchment/Silpat. In a large bowl, combine honey, salt, vanilla, oil, and eggs, mixing until well combined. Stir in the oats and cocoa powder, and let sit for about 5 minutes so the oats can soak things up. (You can chill the batter for an hour or so, but I usually don't and the results are fine). Using two spoons or a cookie dough scooper, scoop the dough 1 to 1 1/2 inches apart on the baking sheet. Press the cookies down slightly with the back of the spoon/scooper to help flatten them. Bake for 12 minutes, until the edges begin to set but the middle is still slightly soft (i.e. firm but not hard). Allow to cool for 5 minutes, then remove onto a wire rack.